Drive your individualized experience on Water Reporter with use of your customized dashboard. When everything is located in one place you don't have to go searching for how to connect all the different components. Access the dashboard by logging in to waterreporter.org. Subscription. Track both the current subscription level and the status of payment for your organization's group subscription plan. You can upgrade to subscription level accounts on behalf of an organization from here as well. Snapshot. Check-in on your personal activity analytics. Organization analytics are accessible through the Manage Account section. Edit profile. Edit and update your organization profile page by clicking on the green encircled pen icon. Manage Account entering into their customized dashboards. Under your associated group you can view all modules in use through your subscription. When you click on Manage Account you'll arrive at a group dashboard that looks the same for all group administrators. You can explore the functionality of each of the subscription features in the subsequent sections of our help files. As we develop new features for subscription account holders, you may see them appear on your dashboard. 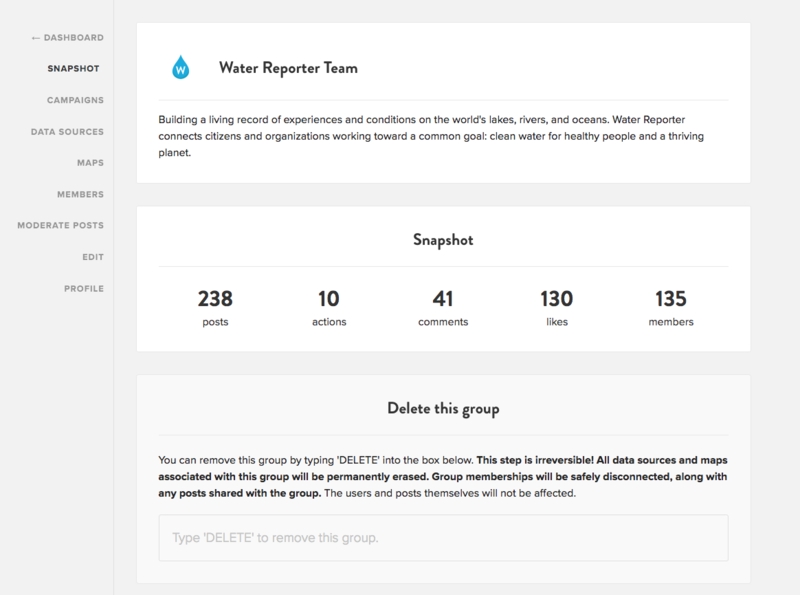 If you don't have access to a feature that you want, get in touch with us at support@waterreporter.org.